3,3-5-L-Triiodothyronine (T3) exerts significant protection against ischemia-reperfusion (IR) liver injury in rats. Considering that the underlying mechanisms are unknown, the aim of this study was to assess the involvement of inducible nitric oxide synthase (iNOS) expression and oxidative stress in T3 preconditioning (PC). Male Sprague-Dawley rats given a single dose of 0.1 mg of T3/kg were subjected to 1-hour ischemia followed by 20 hours reperfusion, in groups of animals pretreated with 0.5 g of N-acetylcysteine (NAC)/kg 0.5-hour prior to T3 or with the respective control vehicles. At the end of the reperfusion period, liver samples were taken for analysis of iNOS mRNA levels (RT-PCR), liver NOS activity, and hepatic histology. T3 protected against hepatic IR injury, with 119% enhancement in liver iNOS mRNA/18S rRNA ratios (p<0.05) and 12.7-fold increase (p<0.05) in NOS activity in T3-treated animals subjected to IR over values in control-sham operated rats, with a net 7.7-fold enhancement (p<0.05) in the net effect of T3 on liver iNOS expression and a net enhancement of 0.58 units in NOS activity, changes that were abolished by NAC treatment before T3. It is concluded that T3-induced liver PC is associated with upregulation of iNOS expression as a protective mechanisms against IR injury, which is achieved through development of transient and reversible oxidative stress. Key terms: thyroid hormone; oxidative stress; inducible nitric oxide synthase; liver preconditioning; ischemia-reperfusion injury; N-acetylcysteine. Preconditioning (PC) is a phenomenon whereby protective strategies render organs resistant to subsequent damaging stimuli such as ischemia-reperfusion (IR), which in liver is of particular importance after tissue resections, transplantation, and hemorrhagic shock (Jaeschke, 2003). PC strategies include surgical interventions, gene therapy, and the use of pharmacological agents that can either inhibit injury mechanisms or induce a low level of stress initiating cellular defense pathways (Selzner et al., 2003; Casillas-Ramírez et al., 2006). In the latter case, however, pharmacological liver PC has not gained access to clinical application, possibly due to the appearance of drug side effects and/or the attainment of unsuitable drug levels to achieve protection (Selzner et al., 2003; Casillas-Ramírez et al., 2006). For these reasons, new potential protective strategies showing effeetive results against liver IR injury have been studied in experimental animals, including the administration of L-3,3,5-triiodothyronine (T3) prior to an IR protocol (Fernandez et al., 2007a). T3-induced liver PC is based on the development of a temporary and reversible increase in the oxidative stress status of he liver within a time period of 48 hours (Fernández et al., 2007a). Liver oxidative stress induced by T3 results from acceleration of energy metabolism and secondary oxidative processes leading to reactive oxygen species (ROS) generation and antioxidant depletion, both at the hepatocyte and Kupffer-cell levels (Videla et al., 2007). Under these conditions, reprogramming of gene expression through activation of specific redox-sensitive transcription factors may occur (Varela et al., 2006), leading to upregulation of the expression of proteins associated with cell protection and survival (Droge, 2002; Janssen-Heininger et al., 2008). Redox regulation of gene transcription by T3 represents an additional non-genomic mechanism of hormone action to those proposed for stimulation of plasma membrane transport, enzyme activities, mitochondrial respiration, and signal transduction cascades (Videla et al., 2007; Davis et al., 2008). This pathway involves (i) the redox activation of nuclear factor -κB (NF-κB), signal transducer and activator of transcription-3 (STAT3), and activator protein-1 (AP-1) (Fernandez et al., 2005a; Tapia et al., 2006; Fernandez et al., 2007b); (ii) upregulation of Kupffer-cell-dependent expression of the cytokines tumor necrosis factor-α (TNF-α ) and interleukin (IL)-l and IL-6 (Tapia et al., 2003; 2006); and (iii) enhancement in the expression of anti-apoptotic proteins, acute-phase proteins, and enzymes, in addition to hepatocyte proliferation (Varela et al., 2006; Videla et al., 2007), which can afford cell protection. In addition to the higher ROS production elicited by T3 treatment, liver nitric oxide (NO) generation is also enhanced, an effect that is reversed toward control values after three days of T3 withdrawal (Fernandez et al., 1997). This effect of T3 is associated with a higher expression of inducible NO synthase (iNOS) through a cascade involving TNF-α release and activation of inhibitor of κB (IκB) kinase (IKK) and NF-κB (Fernandez et al., 2005a), which exert prominent transcriptional control over expression of the iNOS gene in Kupffer cells, endothelial cells, and hepatocytes (Tsukamoto and Lin, 1997). The objective of this study was to test the hypothesis that iNOS is upregulated in T3-induced liver PC through a mechanism triggered by the oxidative stress underlying T3 calorigenesis. For this purpose, hepatic iNOS mRNA expression, liver NOS activity, and liver PC induced by T3 were assessed in a model of partial hepatic IR injury in the rat, either without or with pretreatment with N-acetylcysteine (NAC), and results were analyzed according to histological evaluation. Male Sprague-Dawley rats (Animal facility of the Institute of Biomedical Sciences, Faculty of Medicine, University of Chile) weighing 180-200 g were housed on a 12-hour light/dark cycle and were provided with rat chow and water ad libitum. Animals received a single intraperitoneal dose of 0.1 mg of T3/kg body weight or equivalent volumes of hormone vehicle (0.1 N NaOH, controls) at time zero (Fig. 1). At 48 hours after hormone treatment, rats were anesthetized with intraperitoneal (1 mL/kg) zolazepam chlorhydrate (25 mg/mL) and tiletamine chlorhydrate (25 mg/mL) (Zoletil 50; Virbac S/A, Carros, France), and IR was induced by temporarily occluding the blood supply to the left and median lobes of the liver by means of a Schwartz clip (Fine Science Tools Inc, Vancouver, British Columbia, Canadá) for 1 hour followed by 20 hours of reperfusion, as previously described (Fernandez et al., 2007a). Control animals were subjected to anesthesia and sham laparotomy. Studies with NAC were carried out with the groups described above receiving either 0.5 g/kg of NAC or saline 0.5 hour before T3 administration, thus making up eight experimental groups (Fig. 1). At the end of the reperfusion period (Fig. 1), liver samples taken from the medial lobes were frozen in liquid nitrogen (assessment of iNOS mRNA) or fixed in phosphate-buffered formalin, embedded in paraffin, and stained with hematoxylin-eosin (morphology assessment) (Fernandez et al., 2007a). In separated groups of animals, liver samples were obtained after in situ perfusion with cold 150 mM KC1, 5 mM Tris, pH 7.4 buffer, in order to remove blood, followed by homogenization on ice and centrifugation at 100,000g for 1 h at 4°C, as previously described (Fernández et al., 1997). NOS activity was assayed by monitoring oxyhemoglobin to methemoglobin oxidation by NO at 401 nm versus 411 nm (Knowles et al., 1990). NOS activity was calculated by using the absorption coefficient of methemoglobin (38,600 M-1 cm-1 ) for the wavelength pair 401 minus 411. Results were expressed as nmol NO/mg protein/min (Knowles et al., 1990; Fernández et al., 1997) after protein assessment according to Lowry (1951). Experimental animal protocols and animal procedures complied with the Guide for the Care and Use of Laboratory Animals (National Academy of Sciences, NIH Publication 86-23, revised 1985). Total liver RNA was extracted with TRIzol reagent (Invitrogen Corp., Carlsbad, CA, USA) (Chomczynski and Sacchi, 1987) and quantified by measurement of ultraviolet absorption at 260 nm. For RT-PCR assay of mRNA, first-strand cDNA was synthesized from total RNA (3[ig) using SuperScript RNAse H- Reverse Transcriptase (Invitrogen Corp., Carlsbad, CA, USA) and random hexamer primers [pd(N)6] (Promega, Madison, WI, USA). cDNA was amplified in a PCR reaction using Taq DNA polymerase (Invitrogen Corp., Carlsbad, CA, USA) in the presence of primers specific for rat iNOS. Nucleotide sequences for sense and antisense primers used were 5,-CAACAACACAGGATGACC CTAA-3, and 5,-GGTAGGTTCCTGTTGT TTCTAT-3, (Invitrogen Corp., Carlsbad, CA, USA), respectively. In these conditions, a 417 bp sequence between +133 and +550 bp of rat iNOS cDNA was amplified. To control the relative amount of total mRNA transcribed in each reverse transcriptase reaction, an RNA 18S invariant standard [Classic II 18S Internal Standards (324 bp); Ambion, The RNA Co., Austin, TX, USA] was used. PCR conditions included denaturation, annealing, and extension at 94, 56, and 72°C, for 30 s, 30 s, and 60 s, respectively, for 38 cycles. PCR products were electrophoresed on 2% agarose gels containing ethidium bromide, visualized by UV-induced fluorescence, and analyzed by densitometry using Scion Image (Scion Corp., Frederick, MD, USA) (Tapia et al., 2003). Values shown are means ± SEM for the number of sepárate experiments indicated. Net changes induced by IR under conditions of no treatment (group (a) control) and after administration of T3 (group b), NAC (group c), or NAC plus T3 (group d) were calculated by subtracting individual values of control-IR minus the average value of control-sham, T3-IR minus T3-sham, NAC-IR minus NAC-sham, or NAC-T3-IR minus NAC-T3-sham, respectively (Fig. 1). One-way ANO VA and the Newman-Keuls test assessed the statistical significance of differences between mean values (GraphPad Prism version 2.0; GraphPad Software Inc, San Diego, CA, USA). A p value of less than 0.05 was considered significant. Representative agarose gel electrophoresis of RT-PCR products for iNOS mRNA (417 bp) and for 18S rRNA (324 bp) after ethidium bromide staining in total hepatic RNA samples from groups of animals described in Fig. 1, are shown in Fig. 2A. Normalization of densitometric values of iNOS mRNA as iNOS mRNA/18S rRNA ratios showed 119% increase in hepatic iNOS expression in T3-treated animals subjected to IR compared to control-sham rats (p<0.05) (Fig. 2B), with a net 7.7-fold enhancement in the net effect of T3 over control values (p<0.05) (Fig. 3A), calculated as shown in Fig. 1. In agreement a 12.7-fold increase in liver NOS activity of T3-IR rats, in relation to control-sham animals (p<0.05) was found (Fig. 2C), with a net enhancement of 0.58 units in the net effect of T3 over control values (p<0.05) (Fig. 3B). Both groups of rats subjected to IR alone or to T3 administration alone showed liver iNOS mRNA and NOS activity values comparable to those in control-sham animals (Fig. 2B and 2C). 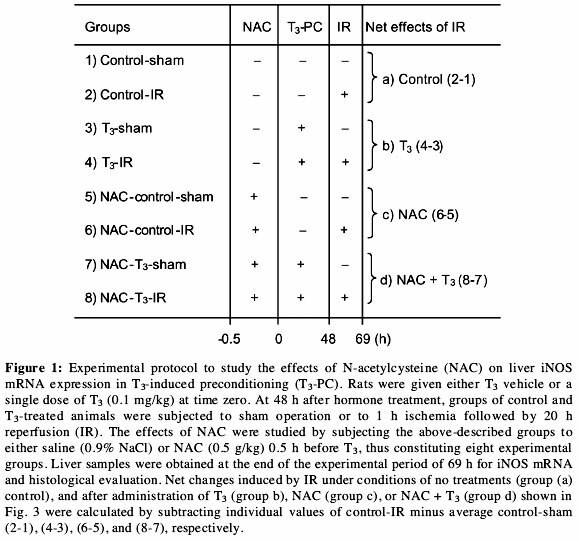 Pretreatment of rats with NAC, 0.5 h prior to T3 administration, abolished upregulation of iNOS expression and NOS activity in the liver of T3- preconditioned rats subjected to IR when compared to the respective control-sham group or control animals without NAC pretreatment (Fig. 2B and 2C), thus abrogating the net effect of T3 (Fig. 3A and 3B). 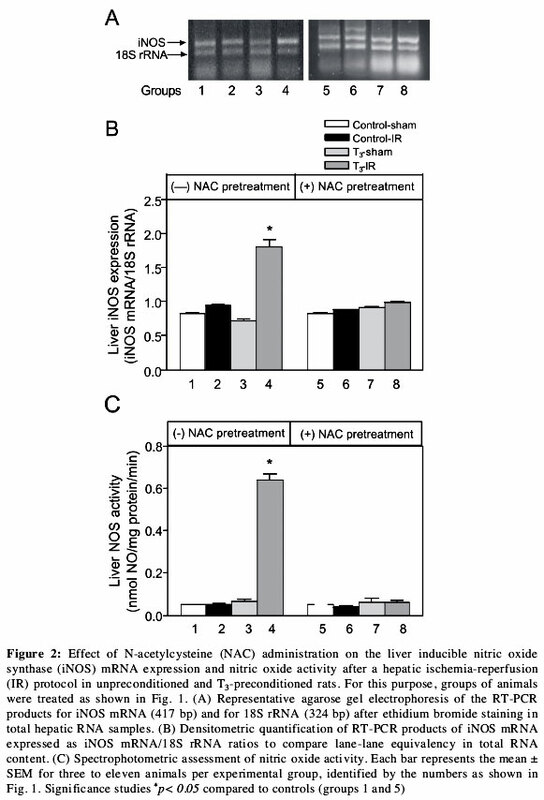 Under the conditions used, NAC pretreatment alone did not significantly modify the hepatic expression of iNOS or the activity of liver NOS (Fig. 2Aand 2B). Light microscopy studies of the liver revealed that control animals (group 1; see Fig. 1) and T3-treated rats (group 3) subjected to sham operation exhibited normal liver histology (Fig. 4 A and 4C). In unpreconditioned animals, the IR protocol used elicited moderate congestion, with scattered cellular necrosis and sinusoidal neutrophil infiltration (group 2) (Fig. 4B), whereas T3-PC rats subjected to IR exhibited normal liver architecture with no apparent hepatic lesions (group 4) (Fig. 4D). In addition, animals pre-treated with NAC prior to T3 administration and subjected to IR revealed extensive distortion of liver architecture, with necrosis in perivenular parenchyma, inflammation, and neutrophil infiltration (group 8) (Fig. 4E). 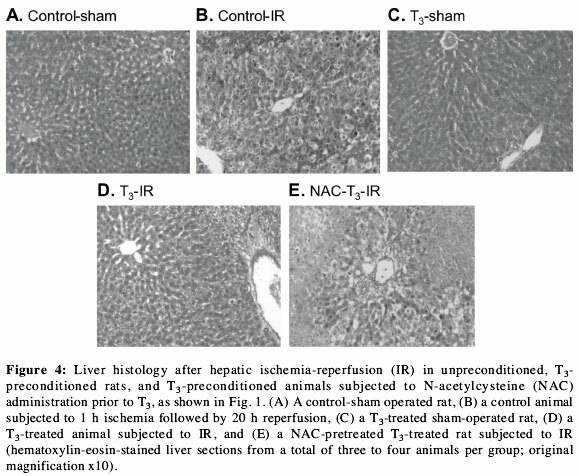 NAC pretreatment did not alter liver histology outcome in control-sham (group 5), control-IR (group 6), and T3-sham (group 7) animals (data not shown), as compared to the respective groups of rats pre-treated with NAC vehicle (Fig.4, A,B,and C). IR liver injury is considered to underlie the development of a severe increase in the oxidative stress status (Droge, 2002; Jaeschke, 2003; Selzner et al., 2003; Gloire et al., 2006), whereas that related to PC strategies seems to be of a smaller magnitude (Casillas-Ramírez et al., 2006), as reported for T3-PC (Fernández et al., 2007a). Data presented in this work confirm earlier observations on the PC action of T3 as evidenced by significant prevention of liver injury induced by IR, which is related to suppression of the oxidative stress component and TNF-α response elicited by IR (Fernández et al., 2007a; 2008). Furthermore, the reported results indicate that T3-induced liver PC is associated with upregulation of iNOS expression and increased liver NOS activity. Significant enhancements in -NO levels may constitute a defense mechanism affording hepatoprotective and anti-inflammatory effects (Laroux et al., 2000), which may be related to a negative feedback control by NO produced by the up-regulated iNOS to diminish excessive activation of NF-κB and transcription of its target genes during the IR protocol, thereby allowing the recovery of hepatic NF-κB DNA binding controlling iNOS expression (Fernández et al., 2007a; 2008), which is lost after IR (Takahashi et al., 2001; Fernández et al., 2007a). The potential role of -NO in inhibiting NF-κB activation and expression of pro-inflammatory genes during IR includes (i) ROS scavenging to decrease the pro-oxidant status oxidizing biomolecules and activating NF-κB (Takahashi et al., 2001); (ii) nitrosylation of NF-κB p50 that decreases NF-κB DNA binding (De la Torre et al., 1997); and/or (iii) induction and/or stabilization of IκB to inactivate NF-κB (Katsuyama et al., 1998). In addition, conditions leading to iNOS expression, which include T3 administration (Wong and Goeddel, 1988; Fernández et al., 1997; 2005a), also upregulate manganese superoxide dismutase (MnSOD) (Fernández et al., 2005b), thus sparing -NO to maintain large -NO levels required for negative feedback signaling (Janssen-Hininger et al., 2000). The causal role of T3-induced transient and reversible oxidative stress in liver PC against IR injury was established by the administration of NAC 0.5 h prior to T3. This protocol led to (i) significant serum levels of NAC that are not detectable at the end of the PC period of 48 h used, which assures its lack of interference with the oxidative stress response induced by IR; and (ii) suppression of both T3-dependent reduction in liver oxidative stress and PC induced by IR (Fernandez et al., 2008). In agreement with these findings, NAC-dependent abolishment of liver T3-PC was evidenced by the reestablishment of severe liver damage observed in the NAC-T3-IR group, which is comparable to that in the control-IR group. 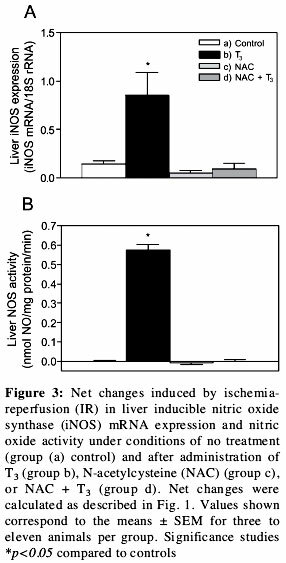 In concomitance, suppression of the iNOS expression and NOS activity upregulating effects of T3 in the NAC-T3-IR group, suggest that T3-PC is associated with oxidative stress-induced upregulation of iNOS expression and nitric oxide generation, which may function as a protective mechanisms against IR injury. Upon administration, NAC is readily deacetylated in cells to produce L-cysteine required for reduced glutathione (GSH) synthesis de novo (De Flora et al., 2001), the major water-soluble antioxidant of the liver (Kaplowitz et al., 1985). Also, NAC per se can function as a direct free-radical scavenger compound and as a specific substrate for glutathione peroxidase and glutathione-S-transferases catalyzing the removal of oxidative stress-derived peroxides and electrophiles (Kaplowitz et al., 1985; De Flora et al., 2001). Although these actions of NAC may explain the suppression of oxidative stress-dependent hepatic iNOS upregulation, NOS activity enhancement and liver injury in T3-PC, other mechanisms can be involved, including the inhibition of the expression of IKK, NF-κB-inducing kinase (NIK) (Ho et al., 1999), and NF-κB nuclear translocation by NAC (Weber et al., 1994; Oka et al., 2000). However, these aspects remain to be studied in T3-induced liver PC. In conclusion, data reported indícate that T3-induced liver PC is associated with upregulation of iNOS and NOS activity as a protective mechanism against IR injury. This is achieved through the development of transient and reversible oxidative stress, being related to the recovery of liver cell signaling functions such as the DNA binding capacity of NF-κB controlling iNOS expression, which is lost during IR (Fernandez et al., 2007a). In agreement with this contention, enhancement in oxidative stress status and NF-κB activation in lymphocytes from hyperthyroid patients are associated with the increase in serum immunoglobulin levels, strengthening the positive influence of thyroid hormones on the immune system (Nandakumar et al., 2008). In addition to iNOS, NF-κB upregulates the expression of numerous genes associated with hepatoprotection, namely, MnSOD, Bcl-2 (Fernández et al., 2005b), and the acute-phase proteins type I (Tapia et al., 2006) after T3 administration, whereas recovery of the DNA binding capacity of STAT3 in T3-PC may also contribute to protection by triggering the expression of acute-phase proteins and hepatocyte proliferation (Tapia et al., 2006; Fernandez et al., 2007b). The involvement of these mechanisms in T3 liver PC is currently under study in our laboratory. This work was supported by grant 1080039 from FONDECYT, Santiago, Chile. * Corresponding author: Prof. Virginia Fernández, Programa de Farmacología Molecular y Clínica, Instituto de Ciencias Biomédicas, Facultad de Medicina, Universidad de Chile. E-mail: vfernand@med.uchile.cl, telephone: 56-2-9786256, fax: 56-2-7372783. Received: March 24, 2009. In Revised form: August 25, 2009. Accepted: September 9, 2009.